We found that for the most part, VA wait times are often shorter than in the private sector, and that VA wait times had improved since 2014 while the private sectors access had stayed the same. Response: The report shows that VA has made real progress since 2014 to improve access and has kept up with, or surpassed, access in the private sector in many cases. Readers should take away that several factors helped contribute to these findings and are important for policy decisions going forward. First, management focus on access has been critical to achieve these improvements. When I came to VA, I established access to care as our top goal for VA.
Second, transparency makes a difference, and publishing wait times should be a goal for all of healthcare. Third same day services should also be a goal for healthcare. It is important to differentiate urgent needs from routine care to get the system designed correctly. Finally, from a national policy perspective for veterans, the goal of designing an integrated system between VA and the private sector is something that I believe is important. The policy objective should be to keep a strong VA to serve the unique needs of veterans, working with the private sector to provide access where VA cannot provide timely or the best quality care. Response: This study focused on specialties on which Merritt Hawkins published data. An expansion of this study into other specialties, such as mental health, would be important. Additionally, an examination of rural geographic areas, where over 30% of Veterans reside, would be useful for policy planning. As noted by Dr. Stephan Fihn, in an accompanying editorial, an assessment of wait times for established patients would also be significant. Future assessments can also include an evaluation of interventions used and their effects on health outcomes. Response: No disclosures of conflict . This work was done during my time as Under Secretary and Secretary of VA. 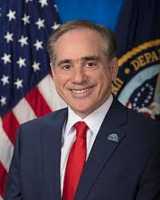 This entry was posted in Author Interviews, Health Care Systems, JAMA and tagged health care, Health Care Systems, JAMANetworkOpen, SecShulkin ‏, VA, veteran's health, VeteransHealth by Marie Benz MD FAAD. Bookmark the permalink.